Vada's Blog Stamp Inks and Paper : Theme Thursday Challenge is Spring. 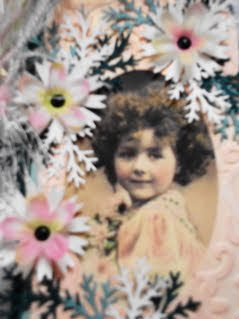 It’s a very ugly day here, rain and fog, so taking pictures wasn’t the smartest thing to do today.My little girl is from Chicks57 Vintage Postcards. I used two punches from Martha Stewart and my embossing folder is from Sizzix. I used Antiqued Glimmers TQ from Dec 09/ Jan 10 newsletter. Very pretty! Love the extra texture of the flowers! 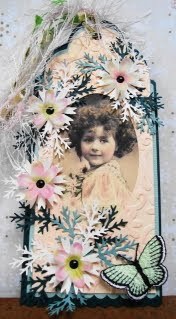 Lovely- great image, and I love the embellishments, such pretty soft colors. The flowers add a nice touch, great tag.